The Zunos iOS App can be downloaded using the following link. Please note that if your account has been deactivated a password reset will not work. You will need to contact your account administrator or contact Zunos Support. Forgot or haven't received a password? You will receive an email, open the link in the email on your iOS device and it will log you in on Zunos. Tap Forgot Password and check your inbox shortly after, open the link the follow the prompts to reset your password. You will receive an email, open the link in the email on your computer and it will log you in on the Zunos WebApp. 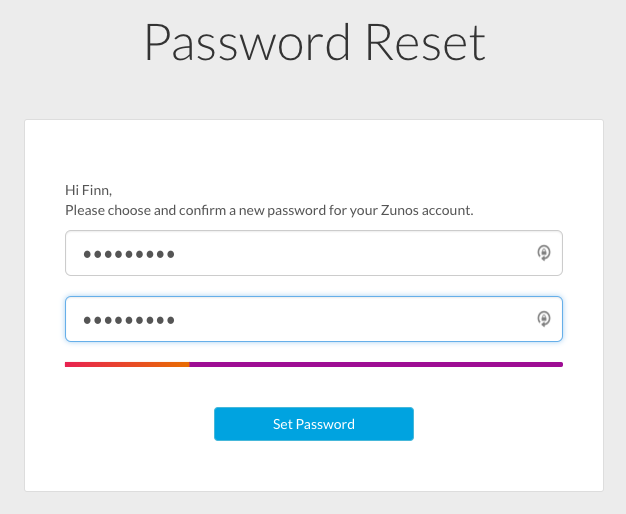 Tip: If you are still experiencing issues resetting your password or accessing your account, contact support@zunos.com with a brief description of your issue and we'll get back to you right away. Note: When resetting your password, you will notice a password complexity indicator visually displaying the strength of the password you are creating.